Alderman Bernard White was in charge of coordinating the opening prayer at the board meeting on Tuesday night. With the clock winding down until he leaves office after serving two terms, he let his wife of 47 years deliver the prayer. Later in the meeting, one-term Alderman Dallas Blackiston asked that the remaining thousand dollars in his discretionary fund go to Parks & Rec, specifically Thalmann Field, the ball field named after the New Bern policeman who was killed in the line of duty in 2014. Quarter-term Alderman E.T. Mitchell asked that the remainder of her funds (she did not specify how much that is) be distributed to Colonial Capital Humane Society. 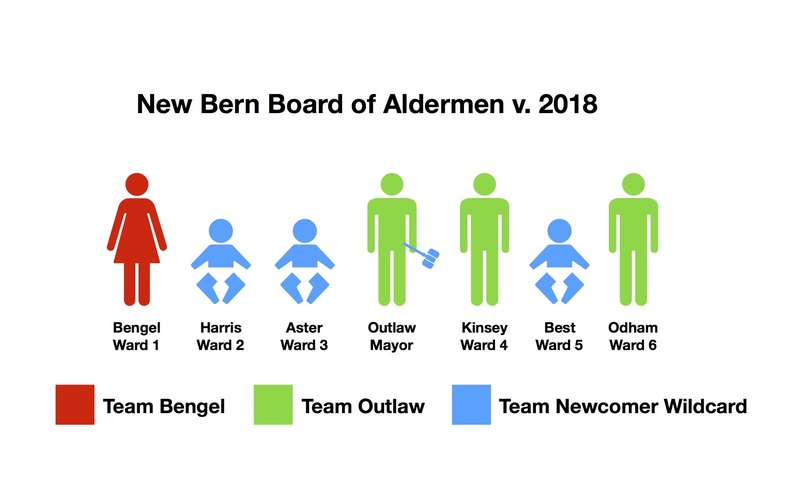 The three aldermen, along with two-term Alderman Victor Taylor, are all leaving office, resulting in the largest turnover of seats on the board since way back in the last election in 2013, when four seats changed hands, or 2009, when six seats changed hands. OK, so maybe that’s not so unusual. Coming back to the board is Sabrina Bengel, who recaptured the Ward 1 seat that she gave up in her unsuccessful run for mayor in 2013. Coming back to City Hall as Ward 3 alderman is Bobby Aster, the retired New Bern fire chief who had sought an appointment to the board when Pat Schaible stepped down in 2016; Aster ran uncontested. New to City Hall are Jamee Harris in Ward 2, replacing Victor Taylor, who did not run; and Barbara Best in Ward 5, who spent 20 years working in City Hall as a tax clerk and, for a period, was interim tax collector, who beat Bernard White. How the four new board members will affect the mix on the board is hard to predict, especially when there are two political novices (Best and Harris) taking seats. But there are some things that I assume will be interesting from the start. First, Sabrina Bengel. She and Dana Outlaw were once friends but their friendship grew stale when both were aldermen and the two found themselves often voting on opposite sides. The end of their friendship came in 2013 when the two ran for mayor and became political enemies. No one prepares for meetings more than Odham … except Bengel, who has been a critic of Odham and Outlaw on her Friday morning radio show, CityTalk. This ought to be interesting. Bobby Aster was fire chief, but also served in interim roles as public works director and city manager during his decades of service to the city. He is arguably more qualified to be city manager than City Manager Mark Stephens himself. When Aster sought an appointment to the board to fill the Ward 3 vacancy left by Schaible, Mayor Outlaw, who has a knack for saying and doing the wrong things at exactly the right times, said (and I paraphrase here) that Aster would be a good choice if he was looking for expertise in firefighting, but Mitchell was a good choice if he was looking for expertise in everything else. Kind of a dumb thing for Outlaw to say. And now Aster has won the seat on his own and may not be a big fan of Outlaw. Regardless of past relations, Aster has proven himself to be a dedicated, intelligent public servant, and I don’t think he will let personal history get in the way of wise decisions. Barbara Best also has knowledge of the inner workings of city hall, albeit her role as a tax clerk was less prominent than Aster’s. Still, it is the clerks, secretaries and other keepers of secrets at an organization who truly know how things work. Ward 4 Alderman Johnnie Ray Kinsey survived his reelection bid (Outlaw and Kinsey were the only two incumbents who faced challengers who kept their seats). Kinsey, a dedicated father who started and runs a successful fitness center after serving time in prison, has been a steady supporter of Outlaw and Odham and I don’t expect that will change. And what of E.T. Mitchell? A former naval intelligence officer who has made the rounds on boards and commissions in New Bern over the past decade, Mitchell did not run to keep the Ward 3 seat she was appointed to. But she has been talking about running for Scott Dacey’s seat on the Craven County Board of Commissioners. Dacey will be stepping down and is running against U.S. Rep. Walter Jones in the 2018 Republican primary.